NEW YORK, NY – March 1, 2012 – The Eric De La Cruz Hope For Hearts Foundation today applauded the nearly $8,000 raised Tuesday through a benefit wine mixer held at New York City’s Vinatta Project to support Hope For Hearts’ financial assistance efforts for heart transplant candidates and their families. 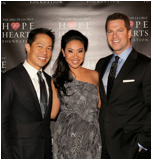 Nearly 150 guests from the media, entertainment, banking and other industries attended the event, which was hosted by De La Cruz and co-hosted by fellow MSNBC personalities Thomas Roberts and Richard Lui. This year, the benefit was held at The Vinatta Project in New York City’s Meatpacking District and featured musical selections by members of Brooklyn band Snowmineand a silent auction to raise money for Hope For Hearts’ candidates. Cellar Angels, a Chicago-based wine buying membership club that has joined in support of the Foundation, generously provided wine for the event. A 501(c)(3) nonprofit organization, the Eric De La Cruz Hope For Hearts Foundation provides financial assistance to transplant patients in need and offers awareness and education programs aimed at supporting those facing the challenge of obtaining a heart transplant. The Foundation was formed in 2010 by De La Cruz after the death of her younger brother, Eric, who suffered from severe dilated cardiomyopathy and was denied insurance coverage for a heart transplant due to his pre-existing condition. Eric De La Cruz passed away awaiting a heart transplant on July 4, 2009. At Tuesday night’s benefit, De La Cruz introduced guests to Kelly Salerno, the mother of a young heart transplant candidate in Connecticut for whom the Foundation is working to raise funds. Colby Salerno is 24 years old and suffers from cardiomyopathy and is awaiting a heart transplant while living in the hospital. In addition to raising funds to assist the Salernos with expenses, the Foundation is making efforts to increase awareness of the urgent need for organ donation throughout the country on the family’s behalf. Among the donated items auctioned in support of the Foundation were a trip to Thailand, a flight aboard a private charter jet, dinner for four prepared by a celebrity chef, and MSNBC/NBC studio tours led by network anchors. Attendees also donated money to attend the event, and several companies donated products and services to help make the benefit a success. The benefit event came at the end of National Heart Health Month, a designation which the Foundation also observed through a “Tip-A-Day For Heart Health” campaign delivered through via social media. Those interested in learning more about heart health and how to support the Hope For Hearts Foundation should visit the organization’s website at http://www.hopeforheartsfoundation.org. On July 4, 2009, Eric De La Cruz ran out of time waiting for a life-saving heart transplant. Founded by Eric’s sister Veronica, the Eric De La Cruz Hope For Hearts Foundation now provides financial assistance, educational resources, and advocacy for other heart transplant patients and their families as they face the daunting task of getting the second chance at life that Eric did not. and two recent MSNBC PSA’s on heart health can be viewed on the Foundation’s video page. Based in Chicago, Cellar Angels is an online wine buying club that offers great wines at discounted prices while donating 10% of net proceeds to a carefully selected list of charities. Most wines offered by Cellar Angels are from family-run, boutique vineyards in the Napa and Sonoma areas of California, so quantities are limited. More information is available at http://www.cellarangels.com.